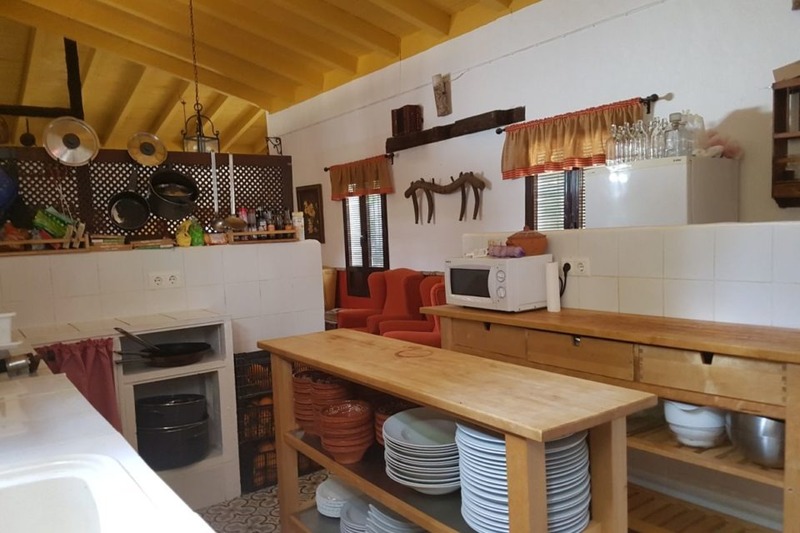 The entire B&B is also for rent as a large holiday home. 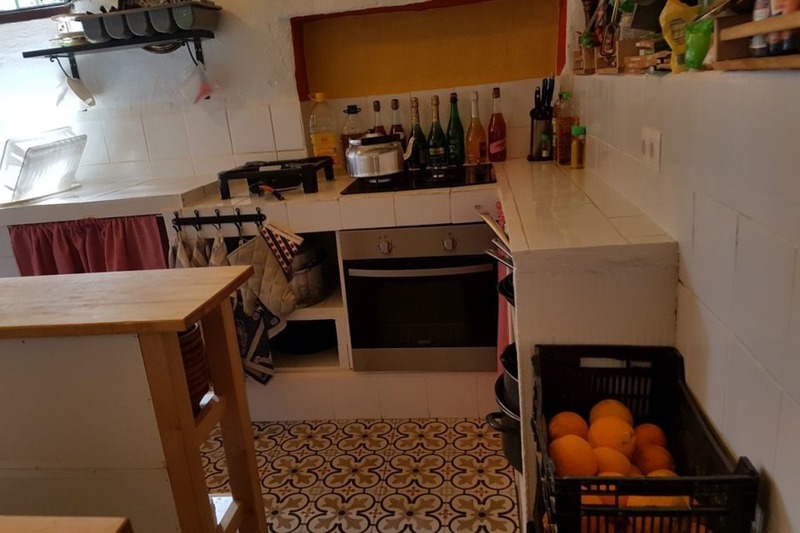 Imagine being the landlord of this holiday home rental! 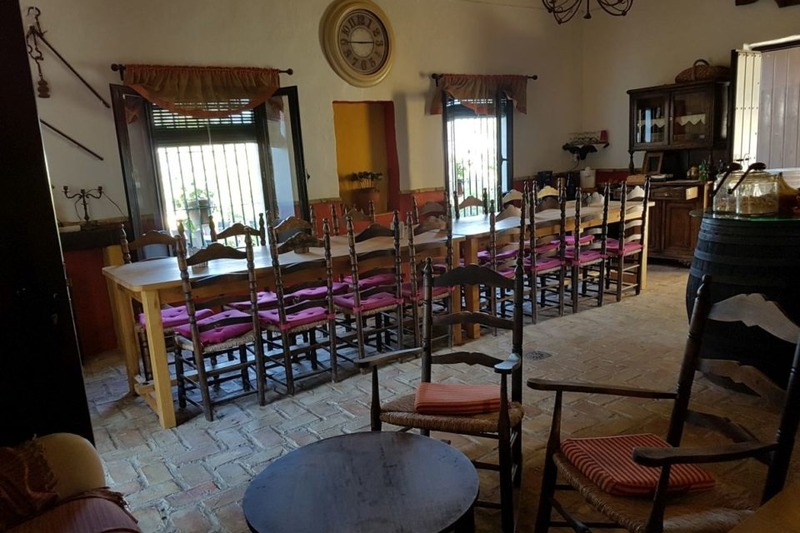 Enjoy living, dining and celebrating in the sun as the Spanish do, together with your friends and/or family in the countryside of Seville. Meal service and cleaning service are also available on request. The entire B&B can be rented as one big luxury holiday home. 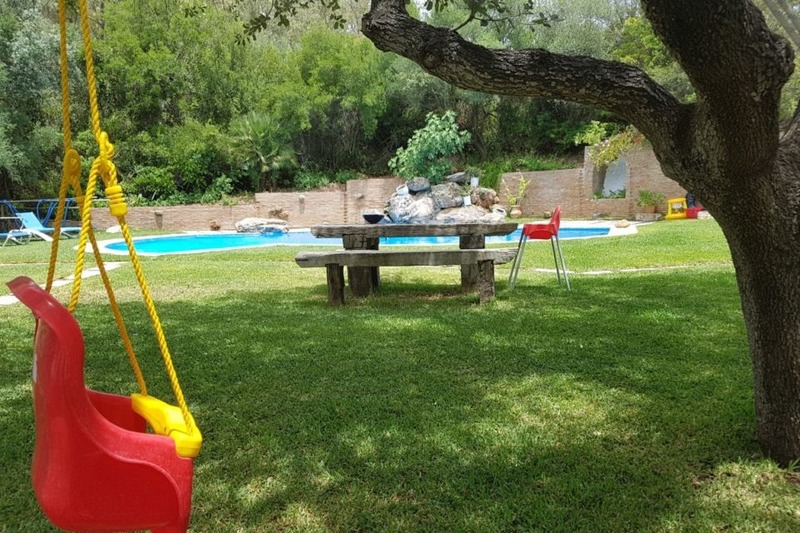 With a swimming pool and a spacious garden (1 hectare) this home is an ideal place to unwind in good company. Outdoor living can be enjoyed perfectly in the summer as well as in the winter. 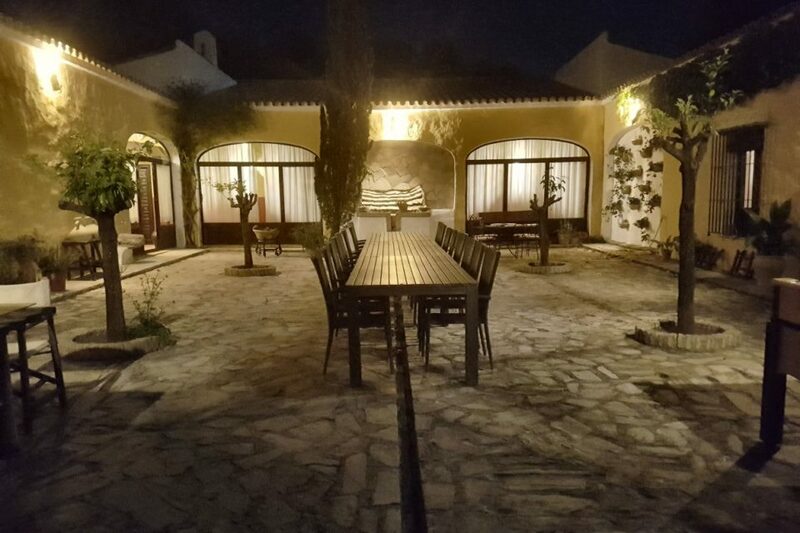 Invite family and friends to help celebrate a special occasion with you, because small events are also possible in this luxury villa in Andalucia! 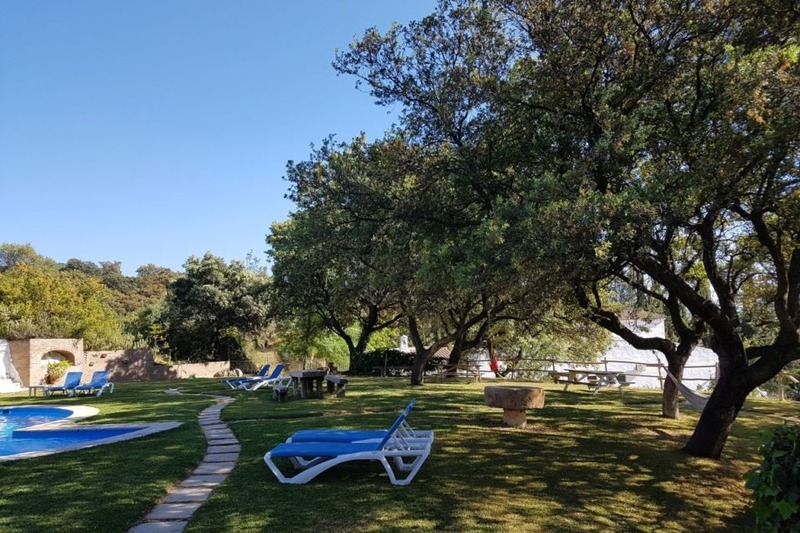 In the summer you can relax by the pool in the shade of the ancient oak trees. 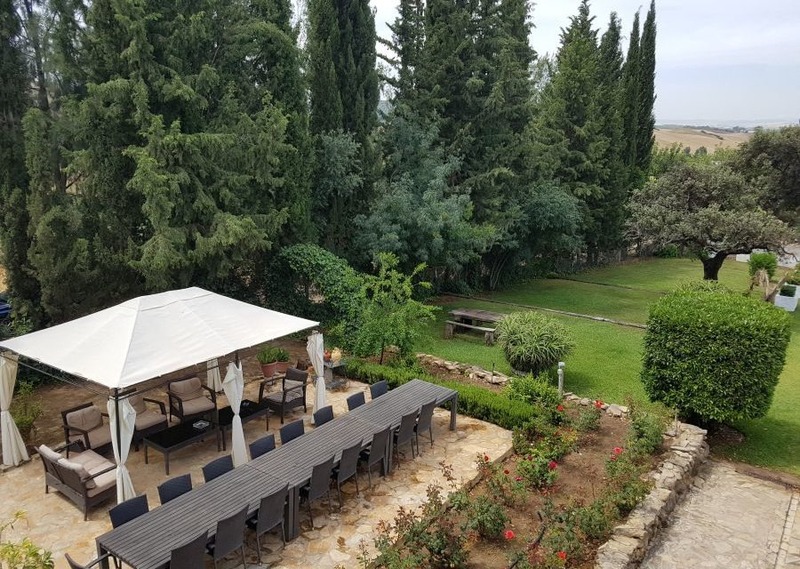 This is also a perfect place for a BBQ in the evening as there is always a refreshing breeze. All the rooms have air conditioning and stay nice and cool. In the winter there are enough perfect spots for a sun-bath – on the patio, in the garden or on the terrace – all are sheltered from the wind. Most days the weather is fine for staying outside. 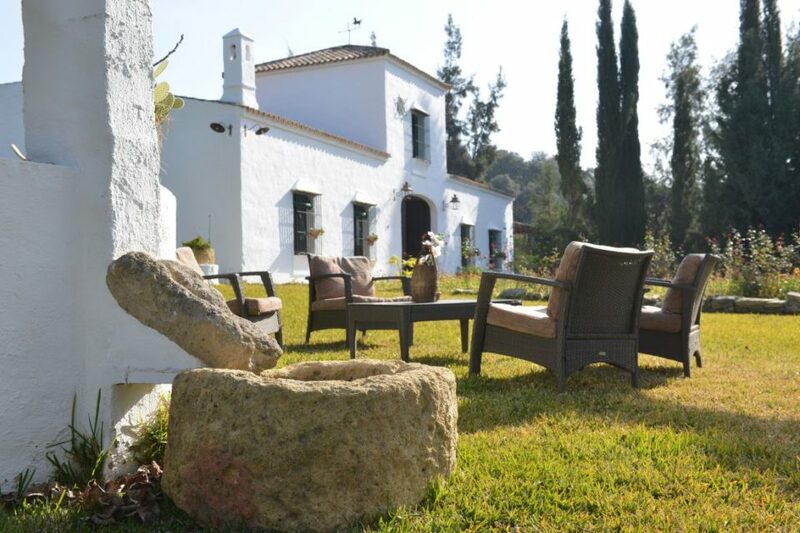 You could have a BBQ in the garden or have a nice walk or visit an enchanting white village in the area. The end of the day is perfect for sitting around the fireplace. All bedrooms have heating too. 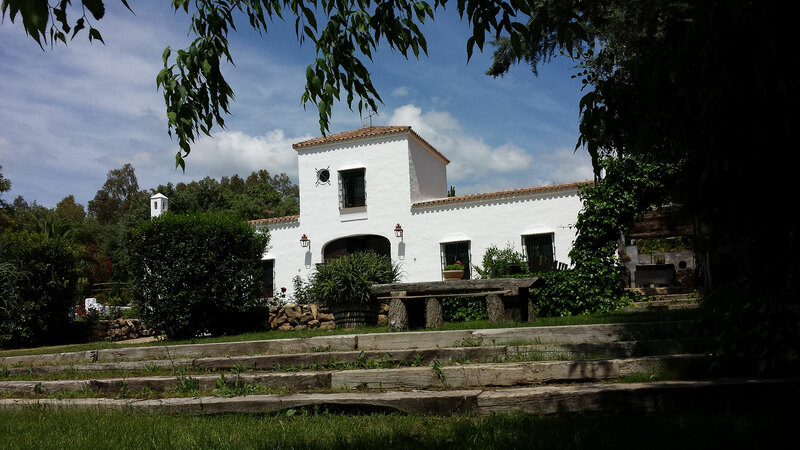 A perfect group accommodation in the heart of Andalucia, in the middle of nature in Southern Spain. 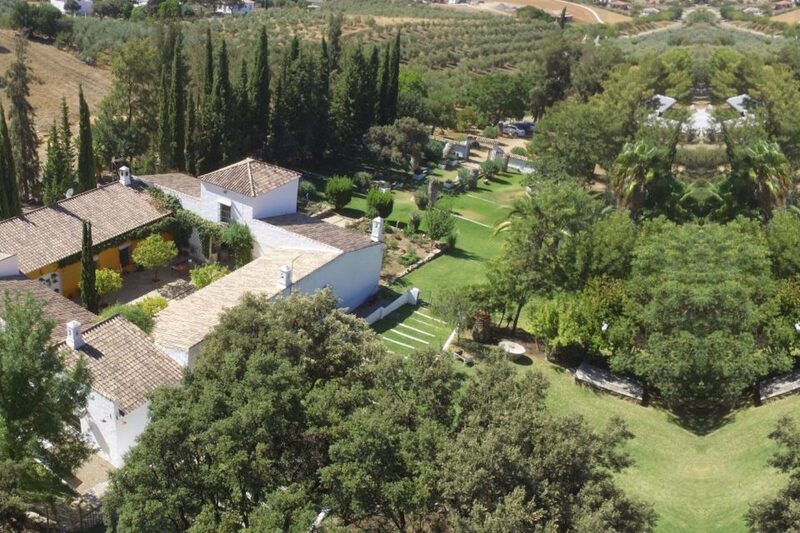 Close to the airports of Seville and Malaga. 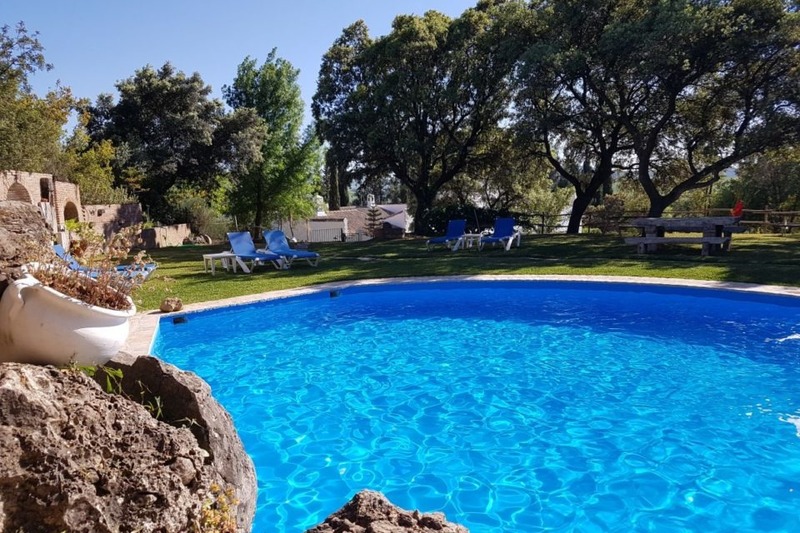 From Seville airport it’s only a one hour drive and just over two hours from Malaga airport. The area is ideal for day trips and activities. 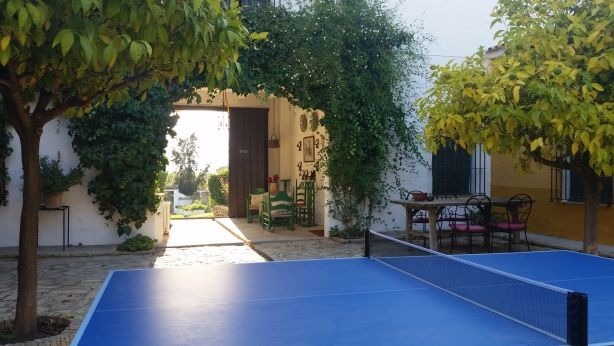 Take a look at activities in Andalucia, Southern Spain. 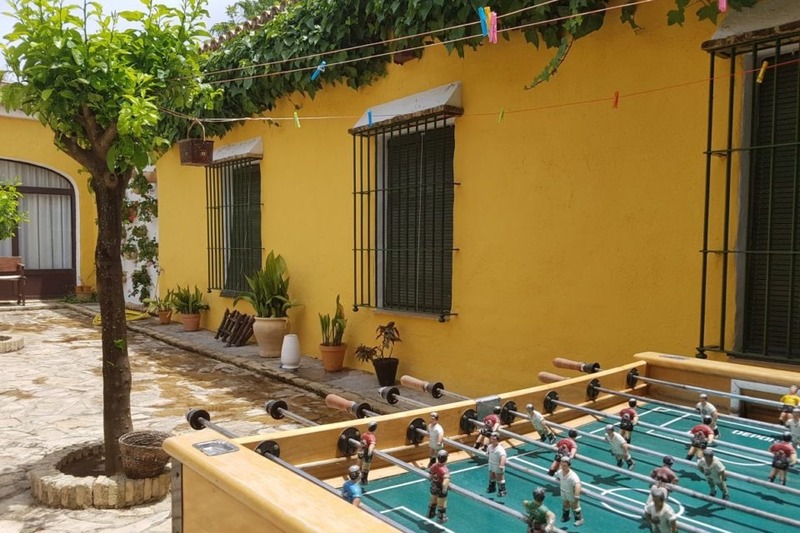 There are 9 bedrooms in total, two of which have a common entrance and a shared shower. The remaining 7 bedrooms all have a private bathroom and a sitting area. 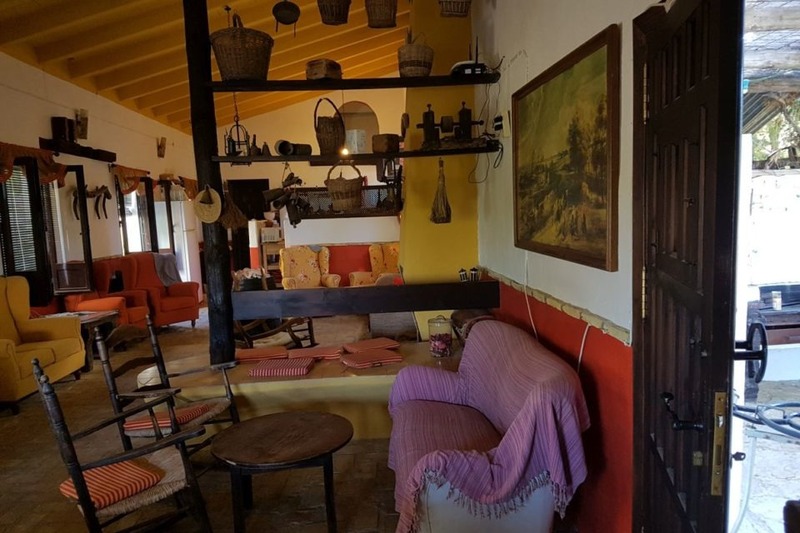 Each guest room has its own characteristic theme and all are beautifully decorated with life-size murals illustrating the typical life of Spain/Andalucia. Week: Saturday to Saturday, €2940. Weekend: Friday to Sunday with late checkout €1100. Contact us for other rental periods. Weekend rental only possible from early November to mid-April. We always give you a personal welcome with a small surprise from the region. In addition, we provide you with the best tips to enjoy the beauty that Andalucia has to offer. Spacious garden (+/-1 ha.) with numerous grassy terraces and romantic spots.